At $1.5 trillion, the Greater New York area's contribution to the US economy not only outstrips all other regions in the Unites States, it also exceeds the GDP of all but 11 countries. If it were its own country, Greater New York’s economy would be larger than both Australia and South Korea. 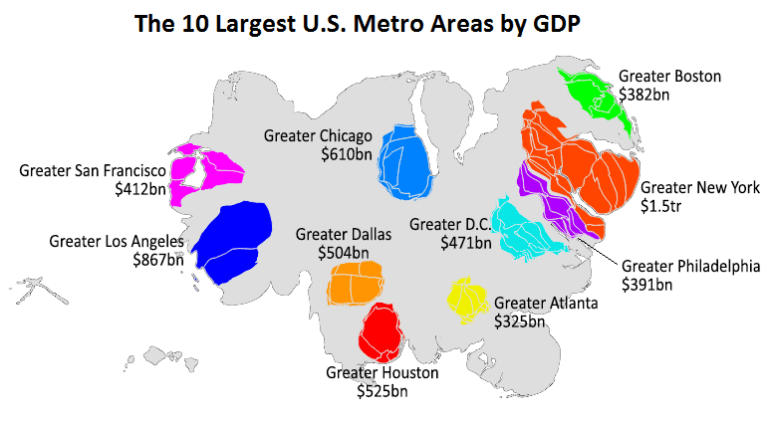 This animated map shows the proportion of GDP coming from each metro area. California, Chicago and the north-eastern area of the country all contribute heavily towards the US economy in comparison with other areas. The large metropolitan areas contribute a disproportionately large share of total GDP compared with more rural areas, particularly the heartland and mountain regions. San Francisco and Los Angeles together bring in more than $1.2 trillion for the economy. The north-eastern area, including Greater Boston, Greater New York and Greater Philadelphia, makes up a considerable share of the economy, contributing more than 36% of the amount that comes in from the top 10 metro areas. Have you read? These countries pay the highest wages US economy: how much does each state contribute? How does your economy compare to US states?